Mythic Delirium - ZineWiki - the history and culture of zines, independent media and the small press. 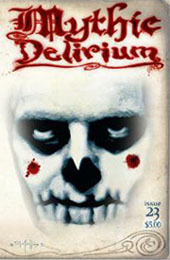 Mythic Delirium is a quarterly speculative and fantastic poemzine edited by Mike Allen. The first issue appeared in March 1998. The most recent issue, #26, is dated Winter/Spring 2012. Poets appearing in the first 26 issues include Danny Adams, Elizabeth Barrette, F.J. Bergmann, Ruth Berman (SH - sf Fanthology), Leah Bobet, Bruce Boston, Lida Broadhurst, G.O. Clark, Constance Cooper, Jennifer Crow, Keith Allen Daniels, Corrine De Winter, J.W. Donnelly, James S. Dorr, Denise Dumars, Roger Dutcher (Uranus, The Magazine of Speculative Poetry), Amar El-Mohtar, Suzette Haden Elgin (Star*Line), Timons Esaias, Kendall Evans, Gary Every, Gemma Files, Jack Fisher (Flesh & Blood), Robert Frazier (Speculative Poetry Review, Star*Line), Sean Russell Friend (Overspace), Joshua Gage, Jeannine Hall Gailey, Neil Gaiman, Tom Galusha, W. Paul Ganley (Amanita Brandy), Greer Gilman, Theodora Goss, John Grey, Scott E. Green, Joe Haldeman, K.S. Hardy, Samantha Henderson, Charlee Jacob, Deborah P. Kolodji, David C. Kopaska-Merkel (Dreams and Nightmares), Ursula K. Le Guin, Mary Soon Lee, Elissa Malcohn (Star*Line), Mario Milosevic, Drew Morse, Karen R. Porter, Wendy Rathbone, Cathy Reniere, Uncle River (Xizquil), Charles M. Saplak, Ann K. Schwader, Darrell Schweitzer (Procrastination), Alexandra Seidel, Marge B. Simon (Star*Line), Christina Sng, W. Gregory Stewart, Kiel Stuart, Sonya Taaffe, Mary A. Turzillo, Scott H. Urban (Frisson), Catherynne M. Valente, Gene van Troyer, JoSelle Vanderhooft, William John Watkins, Ian Watson, Bud Webster (Aniara), Neal Wilgus, Laurel Winter, Erzebet YellowBoy, Jane Yolen, Lee Clark Zumpe, and others. Illustrators included Anita Allen, Mike Allen, Virgil Barfield, Rowan-Michelle Black, Gary Bryant, Cathy Buburuz (Champagne Horror), Don Eaves, Charles S. Fallis, Paula Friedlander, Ted Guerin, Brandt Harrell, Sheila Hodges, Oliver Hunter, Terrence Moliendor, Ian Mullins, Tim Mullins, Stephanie Rodriquez, Marge B. Simon, Bob Snare, Angela Snow, and Daniel Trout. This page was last modified on 14 December 2012, at 20:52.